Lady Gaga song, yes. But not the inspiration for the title. No disrespect Ms.Gaga. The inspiration actually comes from my therapist and a conversation we had last week. The question: Am I hardwired for anxiety? Was I, in a sense, born this way? See my time in the womb may have been less than perfect. My mother was under a lot of stress due to a personal situation going on in her life. Outsiders had voiced their very loud opinions to abort me due to the circumstances and I wonder if tiny little fetus me could absorb that kind of energy. Did I sense that others were trying to demolish me before I truly existed? Could I have picked up on her stressful energy in utero? Did that paint a picture of an unsafe world to enter into? Her labor was no walk in the park either. Perhaps I was rebelling against coming into the world that felt unsafe because I kicked and kicked and bruised her ribs and made a fuss in there! There is a lot of research and studies out there about this topic. What the womb can feel, pick up on and how much the mother’s state when pregnant can affect the child’s disposition for mood disorders such as anxiety, depression, ocd, etc. I am not going to get into all the research and debate either side but it is just something to think about. But here is the thing. Even if I was “born this way” it doesn’t mean I am forever bound this way. Whether you are chemically imbalanced or a series of events or patterned thinking brought you to your current state I truly believe the brain can be re-trained. That it can be re-conditioned. There is also many studies on this which I also won’t go into. Is it easy? Heck no! Does it take A LOT of work, patience, non-judgement of yourself and compassion for yourself, definitely. But it is worth it. I know that I have a series of destructive thought patterns and a tendency to ruminate which gets me in a bad way. I can see how my thoughts have been conditioned over many years that have contributed to my anxiety. The thing about feelings is, it is IMPOSSIBLE to have a feeling without a thought. It may happen so fast it seems seamless but your feelings are a direct response of something you think. Feelings cannot happen on their own without a correlating thought.This often comforts me when I am feeling particularly judgemental about something I am feeling. I think back to the thought that may have provoked it and then I work on disproving the thought and working through the thought process that got me to that feeling rather than judging the feeling. But since thought patterns have been so engraved into your being, you probably have been thinking a certain way for years, it will not be an easy undo. I like to implement to good ol’ stop and replace method. Whenever I see myself falling into a thought pattern that statistically has led me into an anxiety frenzy I envision a giant red STOP sign and replace it with positive thought. Sometimes if the anxiety is bad I am stopping and replacing every 5 seconds but remember what I said in my first blog about your anxiety muscle? You have to keep exercising it before it gets stronger. Just like a new work-out routine, it is hard at first, you may not see immediate results, but keep at it and it will come. With time I am down to like one red stop sign a day! I dream of a world where no red stops signs need to appear in my mind’s eye and it is just green light, go! So even if I entered the world anxious, and I was set up to be anxious, doesn’t mean I cannot overcome it. Maybe you were chemically set up that way because of genetics, or your situations have led you to be this way, or you are not even sure how or why, just remember you do not have to be bound. The brain is miraculous and has capabilities to heal itself more than we know and it just takes some work. As a closing thought, I know that working hard on it is exhausting, especially when you feel so defeated already. Tired, apathetic and like you have been in an uphill battle everyday of your life. Don’t think I don’t have days where I am tired of fighting against my mind. That is okay. I just hope you find reasons to push through. And if you can’t I will help you find all the beautiful reasons why it is worth it. 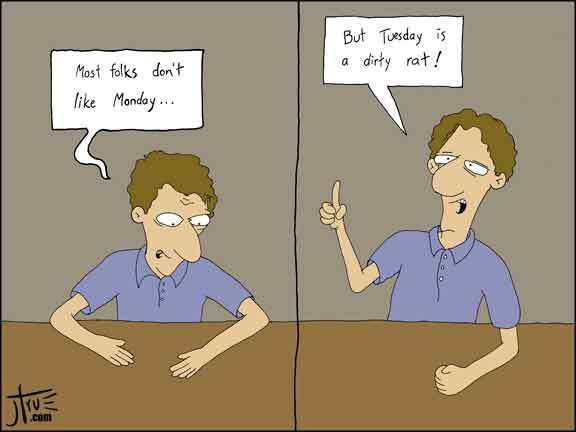 I have always had this thing about Tuesdays. Let me break it down for you. Mondays, people like to hate on Monday but I find Monday to be refreshing. You are relaxed from the weekend. Mind is clear. Ok I laughed as I typed that. You are as relaxed and clear minded as one with anxiety can hope to be. It is a fresh start to the week, no full work week to have banged you down into the ground like a game of “Smack a Mole. Thursday, Thirsty Thursdays. People go out. People feel relaxed because they know there is only one more day left to go. It holds a lot of promise. Friday, I don’t even need to explain this one. Saturday and Sunday, Most of us don’t have to be at work. Enough said. But then there is Tuesday. It seemingly has no redeeming qualities. It is not a fresh start. It is not halfway; it is right at the point where you are still climbing uphill with the weight of Monday on your shoulders. It is blah. Just kind of there taking up space until you get to the hump and then down to the weekend.I make it a rule to do something fun on Tuesdays. Give it some life. What does this have to do with anxiety? Well whenever I am having one of those days, weeks, months when you just feel detached. Kind of blah, you are there and you are doing things but you are not truly engaged as you could be. I say “I feel like a Tuesday”. I bring this up because you might see me say it throughout the life of this blog. I don’t want to confuse you. So to recap: “I feel like a Tuesday” = blah. Everybody got it? One of the things I use to struggle with was saying out loud that I felt anxious or depressed because those words hold so much weight. They hold a lot of stigma as well. Unfair stigma but such is the world. So saying I feel like a Tuesday took some of the weight off. And the thing is, Tuesdays turn into Wednesdays that turn into Thursdays, etc. The point is just because I felt like a Tuesday today, eventually I would feel like a Thursday or a Saturday, and sometimes a Monday. It is impermanent. And knowing that the feeling is just a feeling and it will break also took some of the power and weight out of it. Now make sure to do something fun this fine Tuesday to celebrate the day with no redeeming qualities and put all the other days to shame!